If you dont like fish and Sting Rays, dont do the Divemaster internship! My third week on my Divemaster internship has been much quieter than my first two, mainly because at least i am starting to understand how everything works and where everything goes. I was stuck on dry land for a couple of days and this time was spent fine-tuning my pool skills and I think I made good progress on that front this week as well as finishing most of my manual. The dives I did get to go on were great especially our first dive at Poco Naufragio where we had two of our resident giant rays approach us right up close and Stumpy even sailed right over my head! Pequeño valley is a dive site you have to go to. It has literally 1,000’s of fish everywhere. Our third dive at Moon Pools was wonderful, with the light pouring into the shallow caves and holes in the rocks. Another plus for this week was my mum’s camera arriving from back home so at long last I can take underwater photos again. I’m looking forward to diving Yellow Mountain for the first time this week and hopefully getting much more open water time. 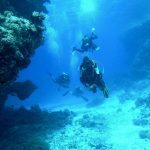 Tagged: Divemaster internship, Diving in Tenerife, Diving Tenerife, PADI Divemaster internship Tenerife.